Police are questioning four suspects in connection with the murder of Parika pensioner, Ramroop Rameshwar, who was bound, beaten and strangled in his home. One of the detained men is said to be a suspect in another murder case. 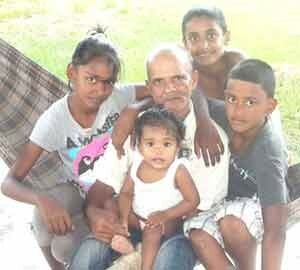 Ramroop, 54, called ‘Old Boy,’ and ‘Isaac’, was found dead in his house at Parika Squatting Area, Essequibo, around 07.00 hrs last Tuesday. A post mortem revealed the cause of death as asphyxiation due to compression strangulation, compounded by blunt trauma to the head and chest. Relatives believe that the killers made off with a large quantity of jewellery the pensioner had in his possession. The dead man’s niece said that just a few days prior to the murder , Ramroop had shown neighbours and persons at the Parika Market a large quantity of jewellery, which he said he wanted to sell to buy a boat and engine for his grandchildren. Ramroop had originally lived at Wakenaam, but had been residing alone, for over a year, in a shack located in the shantytown community. Jean Halley, the slain man’s next door neighbor, said she heard him screaming for ‘help’ about 21:30hrs on Monday, but she assumed that he was merely drunk. She became suspicious around 06.00 hrs on Tuesday, when she noticed that the top half of Ramroop’s door was open. Residents then looked inside and saw the body.